YOU have an essential role to play in nurturing the givers of the next generation. "We'll QUADRUPLE each pound you give." This campaign is ALL OR NOTHING. Today’s generation are often focused upon the ME not the WE. A giving person is a better friend, a better spouse, parent and member of the community and society as a whole. You can educate younger generations NOW on the importance of giving. You can have a major impact in three main areas. Your support means more volunteers matched to those most needing support and help. Because of you students will have a wide range of compelling volunteering options so that each option is a perfect match for the individual. GIFT is constantly initiating numerous new volunteer opportunities in addition to pairing with over 150 charities each year. 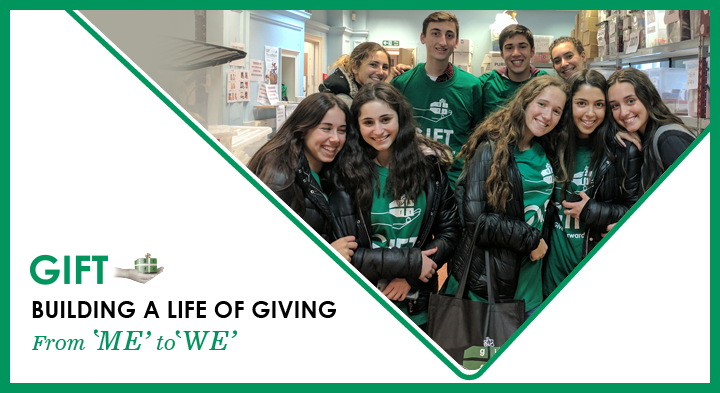 This year over 500 new volunteers signed up for the popular Shabbas Walk initiative which involves helping families, visiting hopsitals and care homes across the UK. 2. GIFT Families – 23,237 bags of food staples delivered in addition to 2,600 food vouchers distributed each year. Your help means 2000 needy people will have the support they need every week. It’s not just enough to enthuse students to become givers, they also need the opportunities to give. That is why GIFT created a charity. GIFT not only teaches young people the importance of giving but facilitates opportunities to do so. 3. GIFT Education - 465 educational sessions in 100 venues across London, Manchester and Israel. Your support means we can deliver more inspiring and impactful sessions teaching students of all ages the importance of the why, how and where to give of themselves, their time and their resources. Because of you, students will have a wide and varied slate of dynamic programmes delivered by our inspired GIFT educators. We need YOU to help us NOW so that we can carry on with our vital work and to allow us to meet the increasing demand for our services. Your donation will mean that GIFT can reach out to more students who will become the givers of today – and tomorrow. At the same time YOU will be providing support for the members of our community who are in desperate need. We have a group of generous donors who have agreed to match each pound you donate TIMES FOUR!!! But you only have 24hours to make it happen. PLEASE give now to enable GIFT to generate more givers in the future. At this time of year when we ask for a year of life, we are all bombarded with requests to give to numerous charities. 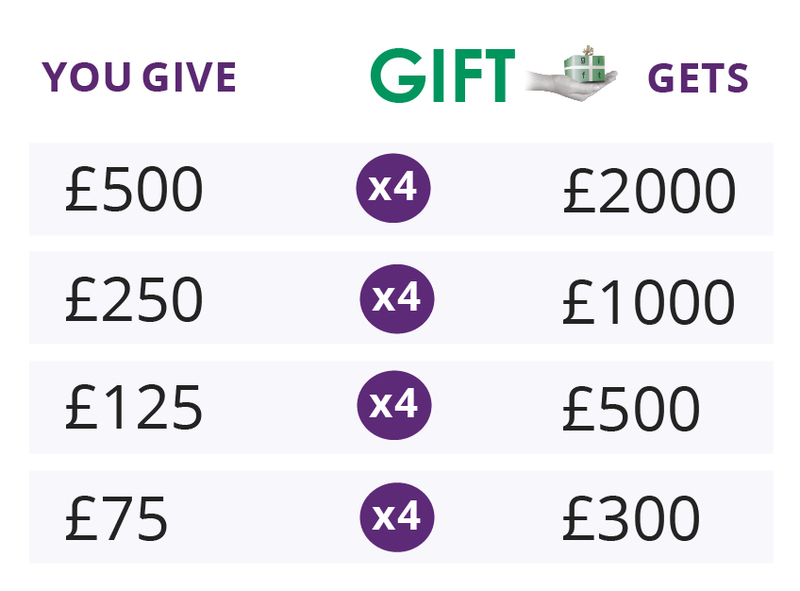 We ask you to give to GIFT today in order to not only breathe life into our organisation but the hundreds of other organisations that benefit as a direct result. From the bottom of our hearts thank you for being a partner with us.